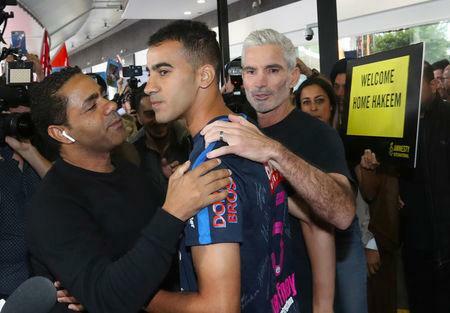 SYDNEY (Reuters) - A refugee Bahraini footballer who was held in a Thai prison for more than two months at the Gulf state's request arrived in his adoptive home Australia on Tuesday, television pictures showed, to cheers and the great relief of his wife. "Australia is my country. I don't have citizenship yet, but my country is Australia ... I love Australia, I will die in Australia," Araibi said after he disembarked in Melbourne airport from a Thai Airways flight. Hundreds of supporters clamored to embrace him, TV footage showed, and cheered "Welcome home, Hakeem!". He wore the colors of Pascoe Vale, the semi-professional team he plays for in Melbourne, Australia's second-largest city. "Finally, this nightmare has ended," Araibi's wife, who has asked for her name not to be published to protect her safety, said in a statement. "My heart is now full with gratitude. Just so thankful that these tears are falling out of relief and joy." Newlywed Araibi went to Thailand for his honeymoon but was arrested upon arrival in Bangkok in November, following an Interpol "red notice" issued at Bahrain's request and brought to Thailand's attention by Australian police. Australian Prime Minister Scott Morrison twice wrote to his Thai counterpart to urge Araibi's release, while Foreign Minister Marise Payne traveled to Bangkok to press for his freedom. Craig Foster, a former Australian soccer captain, also led efforts and drew support from Australia's leading goal scorer, Tim Cahill, and former Chelsea striker Didier Drogba. "To fight incredibly hard for not just a young player who virtually no one knew, but a refugee who was under our protection ... speaks volumes about the character, the values and the pride that we have as Australians," Foster told reporters in Melbourne after embracing Araibi. Australia has announced a review of its procedures for handling Interpol red notices. It said Araibi's case, which it flagged to Thai authorities, should never have been issued because of his refugee status. Interpol notices are requested by member countries and are then issued by Interpol after a compliance check, according to Interpol's website. It is then up to member countries to determine its weight or legal value. Australian police have not commented on the case or their vetting of the notice, beyond confirming that they informed Thailand of Araibi's impending arrival. International law academic Lorraine Finlay, a lecturer at Perth's Murdoch University, said it was not clear what process the Australian Federal Police had followed, other than that it appeared to be highly automated. "Now that Hakeem Al Araibi is back in Australia ... we need to make sure that no person we offer protection to is ever put in this situation again," she said.